Filling Stephen Colbert’s shoes is quite the challenge, but that is what Larry Wilmore is attempting to accomplish. When CBS announced Stephen Colbert would succeed David Letterman as the host of The Late Show, it meant there would be a huge hole in the Comedy Central late night lineup. Ever since 2005, The Colbert Report — featuring Colbert’s faux-homage to Bill O’Reilly — has been a beacon of comedic excellence. Comedy Central could have attempted to recreate Colbert’s satire, but instead chose to go in a different direction with former Daily Show correspondent Larry Wilmore. 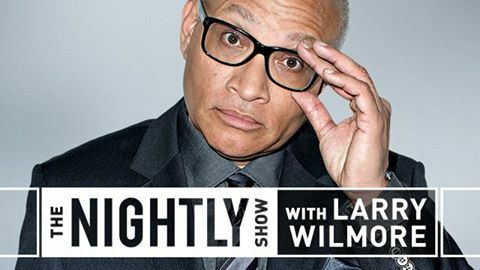 The Nightly Show is Comedy Central’s attempt to resurrect a version of Politically Incorrect with Bill Maher, which ran on the channel from 1993 to 1996, and later on ABC from 1997 to 2002. Each episode focuses on a topic with a scripted opening presented by Wilmore, followed by a round table discussion with new guests each episode. So far Wilmore has covered gay marriage, the state of the black protest, money in politics, and the new film American Sniper. Each episode’s roundtable discussion features journalists, politicians, and comedians with a relationship to the topic. The day after the State of the Union, Wilmore had a roundtable discussion on President Obama which pitted former Obama speechwriter Jon Lovett against Amy Holmes of The Blaze, along with New Yorker Editor-in-Chief David Remnick and comedian Godfrey. The diversity of voices at the table is maintained fairly well by producers, ensuring for active debates on the episode’s topic. The show is far from perfect, which makes sense; it is still in its first month. Some episodes are significantly better than others. The vaccination episode was quite unbalanced with one anti-vaxxer against three vaccination proponents which included CBS medical correspondent Dr. Holly Phillips. Wilmore often makes his position on the night’s issue known from the beginning. His scripted opening is always slanted, while rarely presenting the opposing sides’ view. Some episodes he creates ambiguity going into the panel discussion, but on the gay marriage and Bill Cosby episodes, Wilmore’s biased position was obvious the entire time. In addition to Wilmore’s bias, the comedian guests sometimes seem unprepared for the topics, sometimes even causing their lack of knowledge to obstruct the discussion. This is not always the case, but tends to happen more often than it should and is a distraction. Looking past the misses, the potential of The Nightly Show is quite obvious. On February 4th, Wilmore had his best night yet in a special Black History Month episode about black fathers. The episode skipped the scripted opening and moved straight into the panel discussion which included a variety of prominent black men from diverse backgrounds. Wilmore started the discussion by presenting the group with the statistic: 72% of black babies are born to unwed mothers. Charles Blow of the New York Times broke down the statistic, while Common reminded the group that unwed mothers does not mean absent fathers. The discussion moved from discussing the statistic to evaluating the state of the American black father. The discussion quickly moved in an anecdotal direction with the guests discussing their own relationships with their fathers proving there isn’t one type of paternal experience. “I think our culture gets too caught up in numbers and statistics, and forgets about the people,” proclaimed Wilmore. The episode felt intimate, personal and poignant. 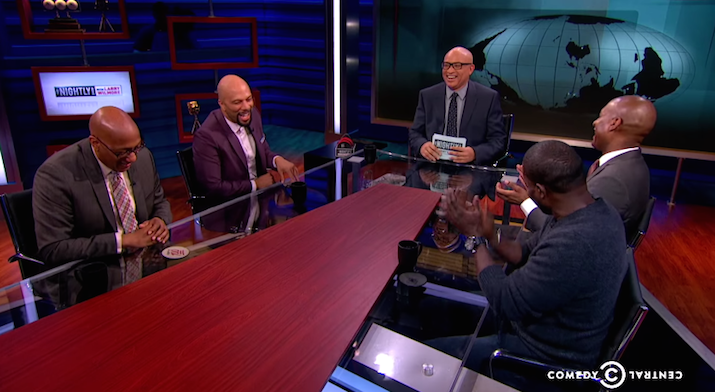 The Nightly Show has a ways to go before catching up with its predecessor, but it is on the right track. The format may not be original, but one thing is for sure, Wilmore is definitely not a regurgitated late night voice. With Jon Stewart retiring and the future of The Daily Show up in the air, The Nightly Show with Larry Wilmore may become the flagship for network — and those will be quite the shoes to fill.